GURPS Timeline is the ultimate resource for the Time Travel GM. 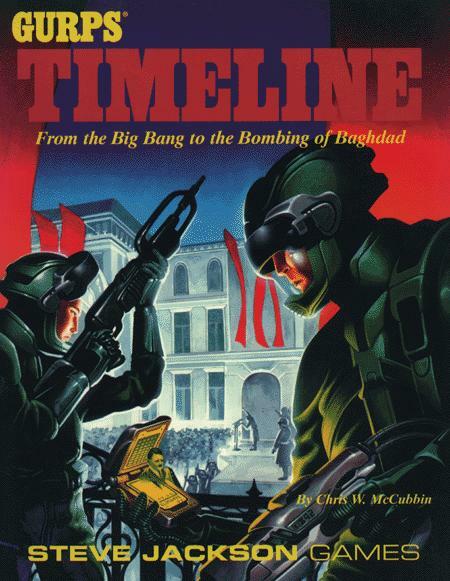 It presents all of human history – from the Big Bang to Operation Desert Storm – in a convenient, easy-to-use chronology. History is big, but GURPS Timeline makes it easy for the GM to find his way around. 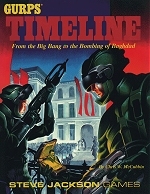 GURPS Timeline also presents the GM with more than 50 historical "adventure seeds" describing particularly important, exciting or bizarre eras and settings for Time Travel adventures – with the spotlight on the stuff you don't get in history class. With GURPS Timeline, time travelers can ride with El Cid, battle the merciless armies of Assyria, hunt for the treasure of the Lost Dutchmen Mine, visit the mystical lost continent of Lemuria or unravel the secret of the Mary Celeste. Also included are detailed descriptions of exotic ancient cultures like the Sumerians, the Olmecs, the Minoans, the Hohokam and the Persians.